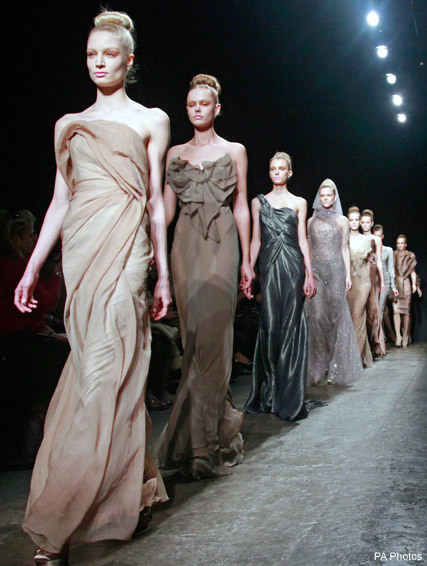 Donna Karan showcased a seductively feminine collection today, to a packed house in New York’s Chelsea. 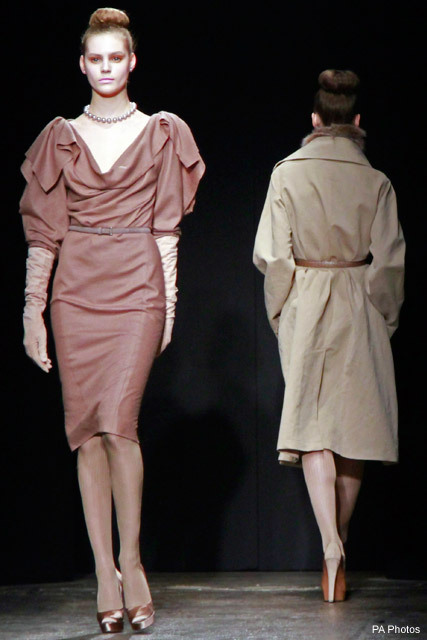 In a soft palette of fawn, cream, sand and greys, the glamorous New Yorker brought back elbow-length gloves, nipped-in waists, slim patent belts and strong shoulders for A/W 2011 – think Grace Kelly with attitude. The theme of the show was ‘pearls of wisdom’ and the looks were all about embracing femininity, ‘but with conviction’. The idea of strength through softness is hardly new (or terribly persuasive) but Donna Karan never fails to create drama and where she leads, style-seekers follow. Who else but the Queen of Seventh Avenue could entice the entire fashion pack to an unprepossessing warehouse on 547 West meets 26th Street during fashion week? The grafitti’d walls and litter-strewn alleyways gave no indication of the magic that was taking place inside as assembled guests were treated to sculpted silhouettes and structured separates, all made from soft fabrics with luxury at their core. Wool, jersey, felt, tweed, moleskin, mohair and silk all featured heavily with plenty of cosy shawl collars and even scarves worn as hoods. Models were accessorised with pearls (naturally) and ballet-buns, courtesy of Eugene Souleiman, with ultra feminine make-up by Charlotte Tilbury for MAC. And then, when it was all over, the NY fashion scene (and a few choice international guests, naturally) skipped off into the bright Manhattan afternoon – all channeling their inner Grace Kelly.